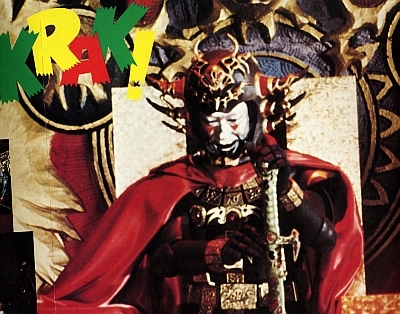 An Eternal Thought in the Mind of Godzilla: Mikio Narita as "Emperor Rockseia the XII"
Mikio Narita as "Emperor Rockseia the XII"
Smokin' "Krak" on account of the wild Batman style sound effects used in the book. Was Message From Space actually supposed to have been "campy"? Like Flash Gordon was two years later?